When I started playing online poker eight years ago, most newbies were in the limit Hold’em rooms. No-limit was seen as an “experts only” area. For me, the thought of losing my entire stack in one hand was terrifying. But one day I swallowed my fear and gave no-limit a try. I knew within the first few hands that it was definitely the game for me. There are several differences between limit and no-limit (aside from the obvious). From the way you bluff to the hands you play, they’re different. Here are some of the differences between the games to help you transition from one to another or just to decide which one you’d rather play. You can’t be a loose-aggressive player in limit Hold’em and still expect to be a winning player. It’s not going to happen. However, there are several very successful no-limit players that are great at playing a loose-aggressive style. In no-limit Holde’m you can win your opponent’s entire stack on any given hand. Hell, you could win multiple opponents’ stacks on any given hand. With odds like that, you can make loose calls with poor hands and hope to get lucky. Limit Hold’em isn’t so forgiving. There’s a cap to how much you can win and you can never win enough money to make loose calls profitable. When you’re playing limit poker, you can’t control your opponent’s odds. If there’s a draw, your opponent probably has the right odds to chase. No-Limit is a different story. If you have a big hand and see your opponent on the draw, you can defend your hand with your entire stack and destroy their odds. In other words, you have total pot control. As I mentioned before, you’ll usually have odds to chase in Limit Hold’em even when you’re behind. 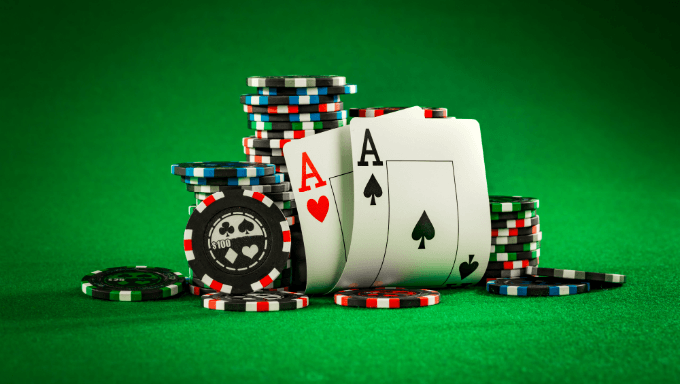 The goal in limit Hold’em is to put as few chips into the pot as possible while you’re chasing. The focus in no-limit, however, is more on getting paid than damage control. When you have a big hand in no-limit, you have to focus on getting your opponents to commit as many chips as possible so you can go all-in. This dichotomy makes no-limit a much more aggressive game. While limit Hold’em is mostly about damage control, no-limit is about cramming and ramming. Not everyone is suited for both games. In fact, most people find that they do well with one and poorly with another. Well rounded players, however, like to be able to play both. The trick to playing both successfully is to know their differences and adjust your game accordingly. When you’re first starting out, however, you need to find the game that you’re most comfortable with and make that your primary focus. Once you find the right game and hone your skills, you’ll see your profits soar.